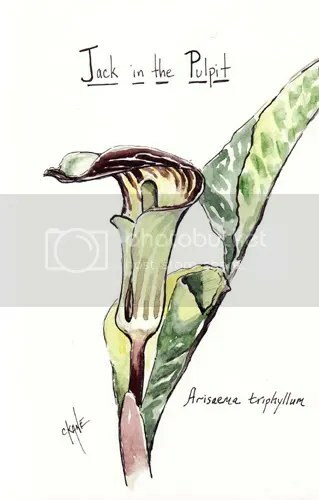 Jack in the Pulpit Sketch – Let's Paint Nature! I live in the Midwest which is not a very exotic place, but this plant, although native, is very exotic to me. I love the shape and the stripes it possesses. It is most dramatic where I found it; in a woodland setting amongst last year’s oak leaves which were scattered about the forest floor. What a wonderful encounter! Here is the actual photo. These guys were pretty small, maybe 6 inches tall. I found them at the Little Red Schoolhouse in Willow Springs, IL. Miracles are unfolding all around us and I am blessed to have found some. Happy Earth Day, indeed. The sketch is amazing. I thank you for sharing it with us. Beautiful. You’ve got the colors JUST right! Beautiful plant, painting and description. Thank you. Abbey: Thanks! BTW, great blog you have, very good information! 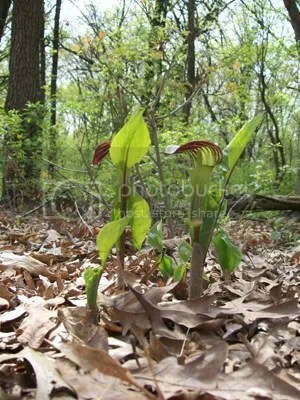 All things nice: I think the plant you are thinking of is Pitcher Plant, a carnivorous plant that has a similar shape. It traps the insects it catches in a liquid at the bottom of its cavity. They both have that tube shaped body! Aunt Bobbie: You are very welcome! Thanks for commenting!